Escape the mundane uniformity of an artificial vegetative mat and enjoy some of the visual and aromatic delights the natural world has on offer! Mowing, edging, fertilising and weeding of a lawn requires more time and maintenance than well chosen ground covers or garden beds / pavers. A rainwater conservation system involves collecting rainwater from the roof and storing it in a tank for later use as irrigation water. Recycling rainwater for use on garden beds is an excellent way of reducing household water that must otherwise be purchased from water companies. Due to the fact that a considerable amount of household water goes on the garden, this is a great way of saving money whilst conserving the amount of water in our storage dams. Will a system work at my house? The type of rainwater system you choose will be determined by your water use requirements, the space you have available for a tank, the collection area of your roof, and the cost of each system. For a small or inner city garden where tank size is limited, a tank connected to a gravity-fed hose and supply for hand watering is most appropriate. 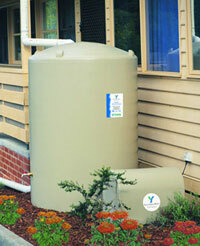 The minimum tank size recommend for use with a pump-fed irrigation system is 2000 litres. Mains water can be linked into the system and accessed by an automated switch-over mechanism, as a backup water source if tank water runs out. To calculate the water that a tank is able to capture off your roof multiply the length by the width of the roof and then multiply this figure by the amount of rainfall over a particular time. For example, Melbourne averages approximately 50 mm of rainfall each month, on an average rainy day (4.5 mm of rainfall) a roof of 150m2 will catch 675 litres of water. In order to collect all of this water, your tank will have to be at least this big. During the wetter months of the year, you may not use your tank at all, in this instance the same size roof has the potential to catch more than 7,500 litres over the month. Below is a guide to how far particular sized tanks will go when full. For tanks that carry 10,000 litres or more we recommend that you seek the assistance of a qualified staff member or professional consultant to tailor a system to suit your water needs. Lawn sprinklers can use at least 800 - 1200 litres of water in a week. It is not practical to use tank water to irrigate a lawn unless you have a large tank. Also lawns usually require watering during the driest part of the year when the tank is least likely to be full. Check with your local water authority on watering restrictions as sprinklers may not be used in some areas of Australia. Click here for a list of Australian Water Links. The range of tanks available is ever increasing, systems are available that can go underneath the house or decking, under the ground, become a wall or are ornamental in their own right. If you have looked at installing a tank in the past but found that nothing was suitable, you may find that today's range might include something that is perfect for you. Please note that many rainwater systems require a licenced plumber to install them. Many Australian Water Authorities have introduced a rebate system for rainwater tanks, greywater systems, irrigation systems and mulches. Click here for a list of Australian Water Links. When water hits a non-permeable surface it will follow gravity to the lowest point, normally a drain. 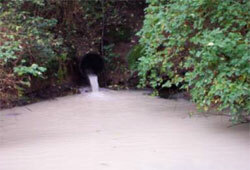 The water then flows down through the storm water pipes into channels and rivers and streams. In heavy downpours the speed this may occur can be quite rapid causing flash flooding, erosion and great levels of damage. 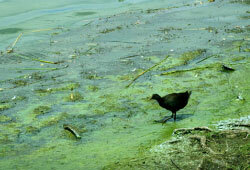 A wide variety of pollutants including oils, fertilisers, pesticides and detergents can be washed into the catchments causing a range of environmental problems. Commonly, toxic blooms arise in our rivers and streams after heavy rain events making them unsafe for the native fauna, pets and humans. Permeable surfaces allow water to permeate (soak into) the soil. The water filters through the substrate where it is retained in the local hydrological cycle. Plants that may be surrounded by paving and vegetation in the adjacent area can then harvest this water. This is achieved not only through mechanical filtration but also through biological processes via microbial decomposition. 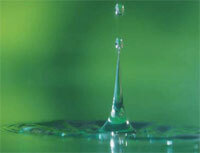 The type of material used determines the overall affect of permeable surfaces on water quality. The table below demonstrates. When installing a permeable surface it is necessary to consider what the area will be used for and overall appearance. In infrequently used areas, mulches are some of the best materials available. They come in a wide variety of colours and materials. Anything from barks to pebbles are commonly used. These products are normally inexpensive and do not require any special skills to install. Mulches in general are highly permeable but do require moderate levels of maintenance and topping up from time to time. Crushed rocks and toppings are slightly less permeable than mulches but can be used for driveways and areas that require a slightly more durable surface. These materials do need to be packed down and require the use of a vibrating plate to ensure that a solid base is achieved. These types of surfaces also need to be topped up from time to time. Permeable pavers are the latest in options when creating a porous surface. They allow water to pass through voids in the pavers and into the substrate below. These may be made from a range of materials including plastic, pebbles or concrete. Grass pavers are part of the permeable paving range and allow grass to grow within gaps in the paver. The advantage of this type of paver they allow grass to grow in areas of higher traffic than normally possible. Grass pavers are normally made from plastic or concrete and are not visible once the grass has grown. Concrete or pebble-based permeable pavers look very similar to normal non-pervious pavers and can be used in many of the same applications as standard pavers. In most cases, both standard and pervious pavers will be used in the same area to reduce costs while achieving similar levels of filtration. 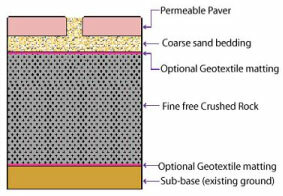 Installation techniques for permeable pavers are very similar to that as traditional pavers, when preparing the substrate the only major difference is that fine-free crushed rock should be used to allow for adequate drainage.